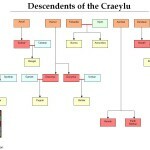 The Craeylu, the Gods of Creation, were the elder gods of Sangrar, who created both the Ealar and the Elder Races. The Ealar are considered their children, though not in any conventional sense – the gods rarely followed convention. Aerdran the Thunderer (air-dran), the Overlord of Nature, the Keeper of the Cycle, Master of the Seasons, God of Nature, Earth Magik, Plants and Animals. During the Elder Days, he roamed the Singing Forest of Heaven, most often in the form of a thunderous cloud.. With his sister, Lillandra, he burned the Pattern of the Seasons into the world. More than any Craeylu, Aerdran and Lillandra took delight in Spirit’s ley lines and his gift to the Elder Races was Earth Magik. He had two children, the Earth Mother and Humak the Beast Lord. Aeriel the Dawn Mistress (air-ee-ell), Goddess of the Dawn, Arra’s Mistress, The Mistress of the Sun, Goddess of Peace, Goddess of Light, The Lady of the Eagles. She soared through Esel on the back of Narandal, the Lord of the Eagles and carried Galador, the spear of her dead brother Lindivar. During the Elder Days, she lived in the Twin Towers of Light and Life with her other brother, Deridean, and from her came the Elder Races’ free will. After the Darkening, she became the Goddess of the Dawn and led the armies of light in the twice daily battles for supremacy of the Suns. The Ealar Sudnar is her son and much later, in the Age of Man, she fell in love with the Vanara Pugnar Lord of the Arena. Deridean the Councilor (duh-rih-dee-in), the Councilor of the Craeylu, the Architect of the Elder Races, the God of Truth and Might. He rode Faldax, the Stallion Lord and wielded Vendellena, a blue crystal spear unearthed by Grandar’s Vergar. He lived in the Twin Towers of Light and Life with his sister Aeriel and from him, the Elder Races gained the wisdom to use Aeriel’s gift wisely. Norath the Seeress was his offspring. Erlik One-Eye (urr-lik), The Dark Lord, the Nightbringer, the Dark One, Lord of the Darkhold, Lord of the Purple Suns, Lord of the Pits and the Prince of Darkness. His favored weapons were his dread whip of shadow and his falchion, Ikkar. During the early parts of the Elder Days, he lived in the Darkhold, which was his prison from the time Annumbra the World Walker trapped him until the Stones fell. The Erlikarrin, Cthar, Morkanis and Ymyrl are his children and the fourth Elikarrin, Ymyrl the Mistress of the Pits, is the result of an incestuous union between Morkanis and Zara. Finbardin, King of Heaven (fin-bar-din), golden Finbardin, the Lord of the Craeylu, the King of the Gods, Father of Heaven, Chainer of Chaos, Leader of the Heavenly Hosts, Master of the Firmament, Creator of Esel, Lord of Time, God of the Sky, Time, War, and Strength. Finbardin wore Byndael, the Crown of Heaven on his brow and carried Formythos, his legendary chains. He lived in Tar-Livarre, his tower at the Gates of Heaven. Early in the Years of Making, he and Spirit fell in love and their children were Numra and Annumbra. Then she retreated into Esel, Finbardin’s gift to her, unable to maintain her form. Before leaving she imparted the secrets of the ley lines to her daughter Annumbra, secrets the World Walker later used to imprison the Dark Lord. Finbardin’s gift to the Elder Races were many, he granted them eternal life, strength to endure and prosper, and a sense of time, so that the world of the Full Radiance would be more than one infinitely long day. Grandar All Father (Gran-darr), the All Father, the Father of the Dwarves, The Maker, Lord of the Forge, The Delver of the Deep, Lord of Ak-Kidarrak, Master of the Vergar. Grandar lived under the slopes of Mount Olindar in Ak-Kidarrak, the Caves of Iron, with the Vergar, weasels with oily blonde coats and rock cleaving claws. Grandar did not create any Ealar, delving and seeing to the Forge Folk took all of his attention, and to the Elder Races, he gave curiosity and the gift of invention. Harnor, Lord of the Spires (harr-nor), Lord of the Spires, the Lord Arcane, Master of the Mere, Master of Magik, the Sorcerer Supreme, God of Sorcery. He built the Spires of Thought, the source of sorcery on Sangrar, on an island in the Mere of Gems, and carried the staff Sidarius, which he made in the Spire’s image. From him, the Elder Races gained the gift of sorcery. Dracorys and Davyrma are Ealar of his creation, but they were not part of Deridean’s design and were made in defiance of Finbardin’s will. The King of Heaven was furious and dispatched Norath the Seeress, the daughter of Harnor’s rival Deridean, to reprimand them. 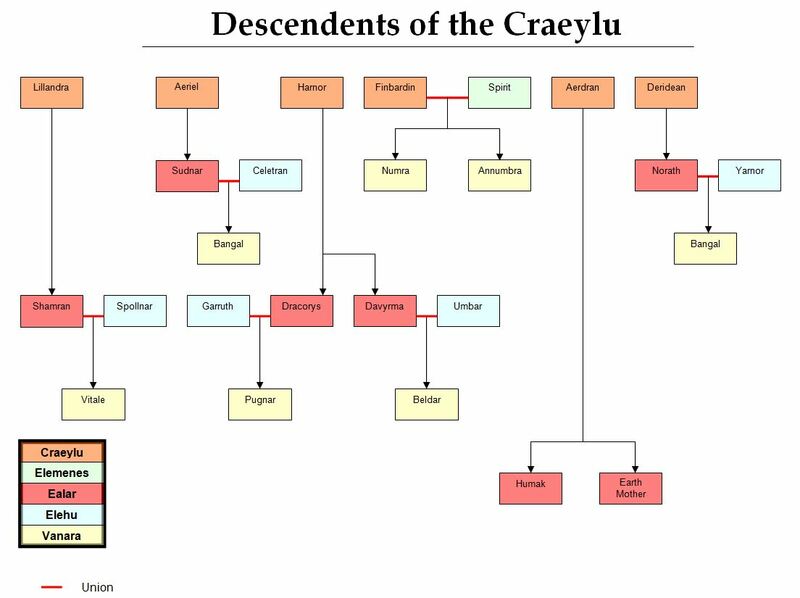 She decreed that dragons, the children of Dracorys and Davyrma, would not come to Sangrar until Dracorys, the male, gave birth to his own child. Norath’s Doom had far reaching consequences. Without it, the Vanara might never have been, Rabyn and Umbar might not have fought and Sangrithar might never have been. Had it not been for Harnor’s arrogance, the reign of the God-Emperors might not have come to pass. Lillandra of the Hearth (lih-lahn-drah), the Keeper of the Cycle of Life and Death, the Mistress of the Seasons, the Lady of Renewal, the Goddess of Fertility, Life, Birth, the Hearth, Creation, Earth Magik. During the Elder Days, she lived in Wentavayya, a Sildar Tree in the Singing Forest. She and Aerdran, her brother, learned about Earth Magik from Spirit before she returned to Esel, and passed on their knowledge to Spirit’s daughter, Annumbra. Shamran the Ealar was her offspring and to the Elder Races, Lillandra beqeathed the ability to procreate.. At the First Congress of the Gods, she pronounced her Ban and forbid the Elder Races from mingling with one another, warning that love gone wrong would bring Sorrow to the world. Nyllen the Minstrel (Nill-enn), the God of the Fair Folk, The Faerie Lord, The Minstrel of the Gods, the Father of Elves. God of Art, Beauty, and Elves. During the Elder Days, Nyllen lived in the Singing Forest, which he taught to sing, and explored its trails from the back of Larindo, the King Pegasi. Like Grandar, Nyllen fathered no Ealar, but he did bless the Elder Races with passion and the arts. After the Battle of Molten fire, when the earth was scarred and in pain, Nyllen played his harp and breathed music into the Earth magik, healing the world and creating the earth song.